Man Of Teal OpenRCT2 Community plays together on several game servers. We are looking for players that want to build in a relaxed environment that are respectful to others and just want to have fun with some good chat. Since you made it this far, all you have to do is create a gamer profile by joining this site, use the name that you're using over on the actual game and ask an admin for permissions. The parks are maintained by Man Of Teal members some acting as administrators. Registration is required to verify email addresses. 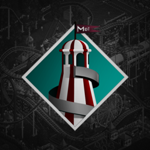 Keeping a membership database allows you to join each other sharing personal builds in photo albums, all here at Man Of Teal OpenRCT2 Gaming Community.